Age: 30 and 29 y.o. We all have to find a way to be more sustainable in every aspect of our lives if we want to continue living a good life on planet earth. Tourism is a rapidly growing business sector and activity that, unfortunately, can have disastrous effects on the environment. We believe tourism can be otherwise and we hope to inspire this in other travelers ! We are both active Zero Wasters and preach minimalism, voluntary simplicity and a deeper connexion to nature. 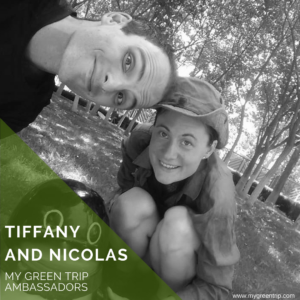 We refuse to produce waste and encourage businesses and people we meet to do so in order to limit the amount of trash that will ultimately end up in the sea or as landfill… and then in a My Green Trip traveler’s bag ! To spread the word further !